A screen capture from today May 22, 2014. All three chicks are mighty hungry! I have seen these majestic birds many times on our hikes here in Missouri, and if you haven't had the opportunity to check out the SiouxZee, Coal and their new baby peregrine falcons on the Missouri Department of Conservation's FalconCam, then your missing out! You can view the live stream from 7am - 7pm every day of the week on FalconCam which is a perfect time for taking an "eye" break while at work, right? If you're looking for a bit of mood music to watch the camera by you may want to visit Old Blue Eyes on YouTube and play it in the background. 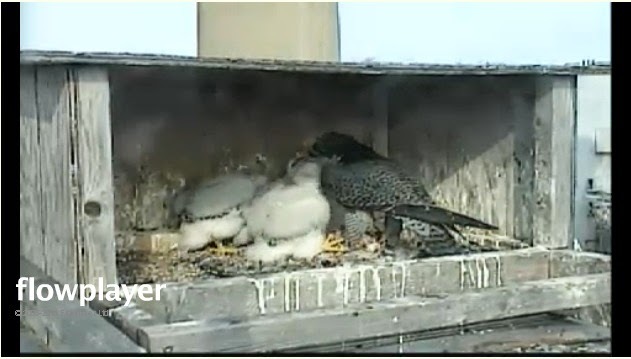 Right now is a prime time to watch as the baby peregrines and their appetites are getting bigger and bigger. Both mother SiouxZee and father Coal are always out finding more food in order to keep the babies growing. 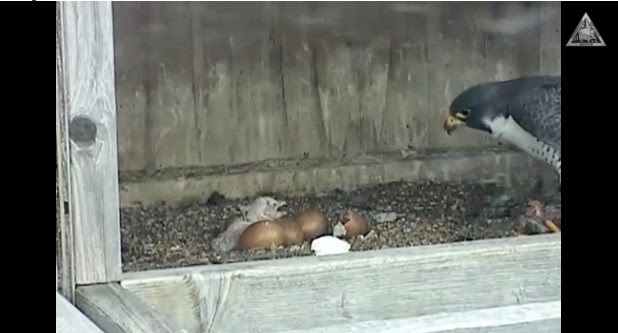 A screen capture from FalconCam. Here the first chick to hatch is only 1 hour old. The site also includes a link to educational materials, where you can learn more about the fastest animals on Earth. You may also be interested in some of the questions that have been asked before, there are some egg-cellent (a horrible, nasty, disgusting pun, and for that I apologize) answers. If you have a question you can also email Jeff Meshach at the World Bird Sanctuary and see if he'll answer your questions too!